The two fluorescein angiograms below show how my eyes looked through a microscope, 30 and 40 seconds after a harmless dye was injected into my arm vein. 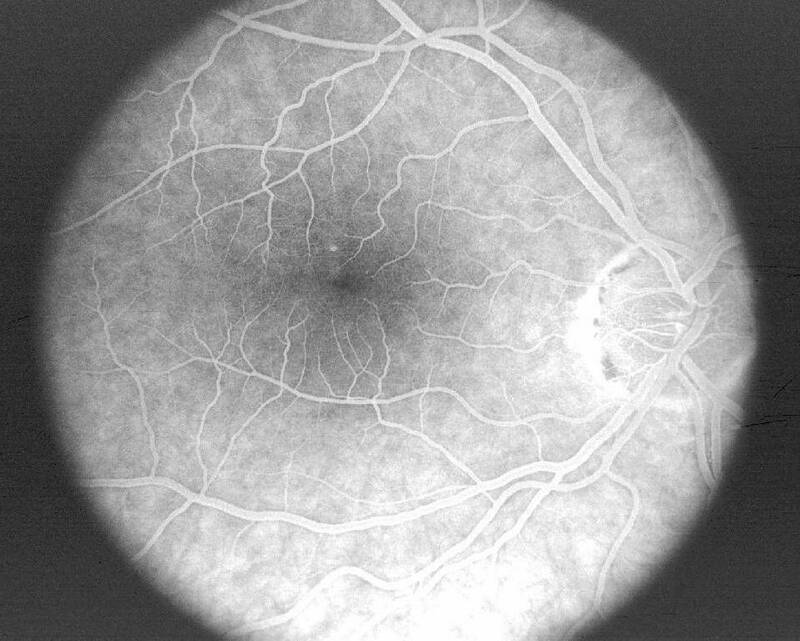 The doctor took a series of photographs starting at the moment of injection and then every few seconds so he could see different areas of the retinal veins fluorescing when strobed by a bright laser light. As a diagnostic tool he can then determine which areas and which vessels may be leaking blood. If the areas are well defined and not directly over the fovea (as they were in my unfortunate case) then he can later perform a procedure called laser photocoagulation to cauterize the leaking blood vessels. Notice the right eye (on the right) has very fine blood vessels intact near the dark spot (macula), whereas the left eye shows a large mass of scar tissue filled with dyed blood. 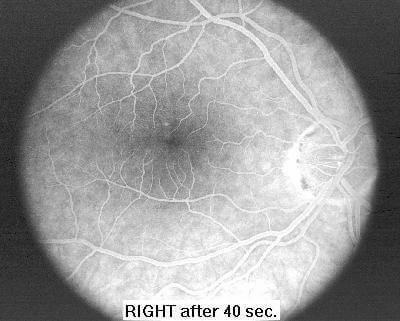 The bright areas (right edge of the right photo and left edge of the left photo) are where the blood vessels enter the eye and is also the spot where the optic nerves feed back to the brain. 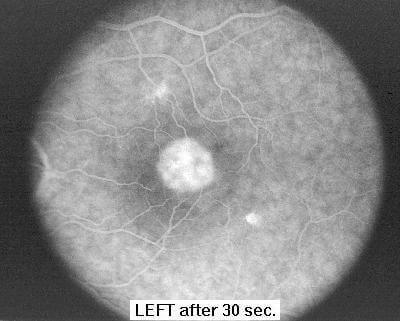 The macula is off to the side of this optic nerve and is only about 6-7 millimeter in diameter. For you photography buffs the sites listed below contain some amazing pictures of eyes (many in full color). At Vision Aware you can read how Age-Related Macular Degeneration affects vision, and see sample photos of how someone with vision loss from age-related macular degeneration would see things. Webvision - The Organization of the Retina and Visual System - has Simple Anatomy of the Retina by Helga Kolb. The Ophthalmic Photographers' Society takes eye photography to a completely new level. Visit link above for a list of exhibition and galleries. From the home page of the Institute of Ophthalmology of the University of Pisa, Italy ocular images of cataract, fundus oculi, eyelids, anterior segment, and tumors of the retina and choroid are available.